No, just no tatee! You are trying to get my naps snatched with this. My hair is too damn thick for this. CC if thats what you believe i will not try to convince you otherwise. i can only speak on my experience with it. CC, what do you use? Hope you guys aren't combing your hair while it's dry. The reviews are good. My hair is very thick and dense but i also thought the denman would be wack but my babe calls it my obeah/voodoo brush. Lol i can't use it anymore, it's his brush now. I'm going to give this and the other one a try. I'm excited, kind of pricey for a comb but it's a necessity. In my city i pay $18 for a denman. Hiway robbery. I read your post in a calm soothing tone like a yogi lol. 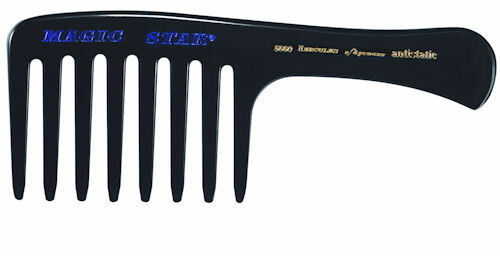 I have a similar comb with tall teeth and it's just not for my me. I'm glad it's working for you though. JP, I use fingers and the babyliss brush posted on the other page for detangling. i have the small one with small teeth and only used it once it doesnt work for me. i think that comb is for small children. i should sell it. lol it was just so calming. You should sell it. It looks like it would work well for twas too. Slide through like butta. I too pictured tatee in a red robe, sitting atop a mountain with feet folded in her lap I read that.